There are a lot of benefits to being a freelance web designer. Getting to work the way you want and where you want, for instance. But there are also some serious downsides to consider. The truth is that freelancing isn’t for everyone. Aside from the freedoms that come along with going it alone, you also get a healthy dose of risk, along with our own fears, as well. It’s unavoidable and must be accepted as part of the job description. 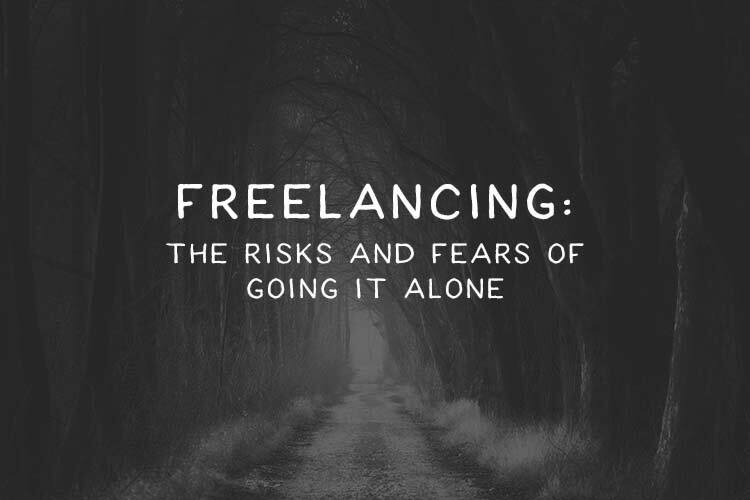 Today, we’re going to look at some of the real risks and associated fears of being a freelancer. But don’t worry – we’re not trying to scare you! If you’ve thought about taking the plunge and starting your own business, it’s best to know what you’re getting into. And, even if you have been in business for a while, there may be some things you haven’t really thought about. We’ll not only explain these items, but provide you with some helpful advice on navigating them as well. Let’s get started! This may well be the scariest part of being in business. Financial struggles can have a major impact on both your business and life. Of course, everyone’s goal is to (at least) make a decent living. And quite often it’s a realistic one. However, there will always be ups and downs. There may be times when you will struggle to pay the bills. Plus, depending on where you live, taxes can only add to your burden. One way to look at this is that you’ll usually make what you earn, save for the occasional non-paying client. Therefore, staying busy is one of the best defenses against going broke. So, aim to keep that calendar full of projects. Planning also can mitigate some of your risk. For example, putting aside some extra money in good times will provide you with some fallback resources – just in case. We’d all love to have a team of super-smart developers working for us. But the reality for most freelancers is that we have to take care of things ourselves. With that comes the risk of being asked to do something you’ve never done before. Depending on your personality, this kind of thing might keep you awake at night (it still does for yours truly). The fear is that you won’t be able to deliver what a project requires. The potential result is upsetting your client and leaving you feeling embarrassed. Again, it comes down to perspective. Instead of stressing, you might choose to look at this as a real opportunity to learn something new. Learning, after all, is an essential part of staying on top of your game. Sometimes, we tend to think of learning in terms of a more formal educational setting. But we can learn just as much, if not more, through actual experience. And there’s nothing quite like knowing that you have to learn something to get you motivated. The bottom line: Don’t be afraid of what you don’t know. As the one-and-only boss, you get to call the shots. And you’re also responsible for virtually every part of your business. It’s a lot of weight on your shoulders (no matter how much you work out). This is actually part of being a freelancer, though. The job requires a certain degree of self-reliance to be successful over the long term. Still, it can feel awfully lonely when you’re drowning in work or stuck on a complex problem. “Overwhelming” might be the best term to describe it. There are some things you can do to lighten the load, however. If your financial situation is solid, you could hire on another freelancer to help. Even if it’s just to tackle a single issue you’re facing, that can provide a big boost to your mental health. Another way to get some peace of mind is to connect with the web design community via a meetup or social media. There are undoubtedly others out there who are experiencing the very same types of challenges. Just communicating with someone who can empathize with your situation can make a positive difference. The day-to-day life of a web designer often includes dealing with clients on some level. Whether that be through meetings, phone or email conversations, some basic people skills are a valuable asset. Even if you’re very outgoing, client relations can be stressful. If you’re more introverted, the whole thing can sap you of energy. It’s really the most delicate responsibility of freelancing, as you need to learn how to manage the various personalities you’ll encounter. Just keep in mind that you don’t have to be perfect. You don’t need to come up with witty things to say or specialize in small talk. As long as you’re polite, helpful and courteous, you’ll be on your way to building solid relationships. Even if this scares you to death, you can still learn and improve. The more practice you get, the better you can deal with it. Indeed, a big part of being in business is taking risks and conquering fears. Even the act of starting a business itself is risky – especially if you’re leaving another job to venture off on your own. But these kinds of uncertainties shouldn’t stop you from being yourself and doing what you love. The key in all of this is in managing your expectations and learning from your experiences. We all make mistakes. Sometimes, they can be pretty big ones. And there is always a chance that we’ll be stuck in a spot where we don’t exactly know what we’re doing. This is all part of the process. And it’s even okay to be scared, as long as you use it as motivation to keep improving. The post Freelancing: The Risks and Fears of Going it Alone appeared first on Speckyboy Web Design Magazine.